The Atlantic rainforest and food growing areas were lost to eucalyptus plantations for celulose exports by Aracruz (Fibria). Local communities claim the recovery of their ancestral lands. New conflicts arise with transgenic eucalyptus. 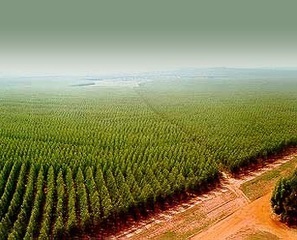 Brazilian company Aracruz Celulose S.A, today Fibria Celulose, is the largest producer of bleached eucalyptus pulp in the world. The company owns more than 320,000 hectares of eucalyptus plantations in Espirito Santo State and has destroyed more than 50,000 hectares of Atlantic rainforest. In the north of Espirito Santo, Aracruz seized 11,000 hectares of indigenous territory, driving 8,500 families out of their homes and restricting access to food and water. The Atlantic rainforest in the region completely disappeared after 40 years of eucalyptus plantations. But indigenous movements of Guarani and Tupinikim peoples, together with Quilombola people (Afro-Brazilian communities) have been struggling for years to protect and to get back their territories. The recovery of their land, exhausted by the intensive eucalyptus production, is coupled with the revival of traditional food production. Such struggles over the land provoke violent altercations and Fibra’s guards have murdered locals. Moreover, since April 2015 the commercialization of genetically modified eucalyptus is authorized in Brazil. This approval has raised the movements’ opposition in Brazil and world-wide, pointing to the increasing environmental risks such as water shortages and the quality of honey from bees visiting genetically modified eucalyptus plantations. Project Details This project produces 2.4 million tons of bleached pulp annually out of which 97% is for export. The company consumes about 250,000 cubic meters of water per day. The plantations have taken over the coffee plantations territories, which previously provided 200,000 jobs, when the eucalyptus only can provide 4,800 jobs. Development of Alternatives To have their land back and their territory restored from the contamination produced by the plantations. The recovery of the native rainforest is today impossible. Why? Explain briefly. Despite the strong present opposition and in spite of the recognition of the territory as indigenous and the return of some of the seized lands, the plantations continue, as do the explotation of the land and the contamination of the territory causing the environmental impacts recorded. Genetically modified crops represent a new threat to the environment, the traditional farmed crops and humans' health. Certificando lo incertificable. Certificacion del FSC de plantaciones de arboles en Tailandia y Brasil. Movimiento por los bosques 2003. Pulp mills. From monocultures to industrial pollution. Movimento por los bosques. Aracruz Celulose and the World Cup: propaganda and deforestation. Movimiento mundial por los bosques 2006. Plantations campaign. Pulpwood plantations: a growing problem. Movimiento por los bosques 1999. Manifiesto contra el desierto verde. Red Alerta contra el desierto verde. 2004. Plantaciones de eucalipto y produccion de celulosa. Promesas de empleo y destruccin del trabajo. El caso Aracruz Celulose en Brasil. Movimiento por los bosques 2005. Carta aberta ao Governo Federal. 8 de maro 2006: 2000 mulheres ocupam o viveiro da Aracruz Celulose. Fabricas de celulosa. Del monocultivo a la contaminacion industrial. Movimiento por los bosques. Tree plantations: Impacts and struggles. Movimiento por los bosques. 2011. El modelo forestal-celulosico en cuestion: los impactos en el Cono Sur. Tribunal de los Pueblos. Viena 2006.